Vladimir Guerrero Jr. does not have any MLB stats for the season. April 11, 2019 3B Vladimir Guerrero Jr. assigned to Buffalo Bisons from Dunedin Blue Jays. 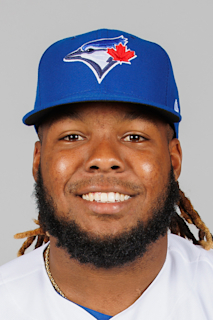 April 4, 2019 3B Vladimir Guerrero Jr. assigned to Dunedin Blue Jays from Buffalo Bisons. January 28, 2019 Toronto Blue Jays invited non-roster 3B Vladimir Guerrero Jr. to spring training. July 31, 2018 3B Vladimir Guerrero Jr. assigned to Buffalo Bisons from New Hampshire Fisher Cats. July 28, 2018 New Hampshire Fisher Cats placed 3B Vladimir Guerrero Jr. on the temporarily inactive list. July 19, 2018 3B Vladimir Guerrero Jr. assigned to New Hampshire Fisher Cats from Dunedin Blue Jays. July 17, 2018 3B Vladimir Guerrero Jr. assigned to Dunedin Blue Jays from New Hampshire Fisher Cats. July 13, 2018 New Hampshire Fisher Cats sent 3B Vladimir Guerrero Jr. on a rehab assignment to GCL Blue Jays. June 7, 2018 New Hampshire Fisher Cats placed 3B Vladimir Guerrero Jr. on the 7-day disabled list. April 3, 2018 3B Vladimir Guerrero Jr. assigned to New Hampshire Fisher Cats from Dunedin Blue Jays. March 8, 2018 3B Vladimir Guerrero Jr. assigned to Toronto Blue Jays. October 14, 2017 3B Vladimir Guerrero Jr. assigned to Leones del Escogido. July 10, 2017 3B Vladimir Guerrero Jr. assigned to Dunedin Blue Jays from Lansing Lugnuts. July 7, 2017 Lansing Lugnuts placed 3B Vladimir Guerrero Jr. on the temporarily inactive list. April 3, 2017 3B Vladimir Guerrero Jr. assigned to Lansing Lugnuts from Bluefield Blue Jays. March 25, 2017 3B Vladimir Guerrero Jr. assigned to Toronto Blue Jays. June 23, 2016 3B Vladimir Guerrero Jr. assigned to Bluefield Blue Jays. July 2, 2015 Toronto Blue Jays signed free agent OF Vladimir Guerrero Jr. to a minor league contract.